Trendalope: Oh How I Want! 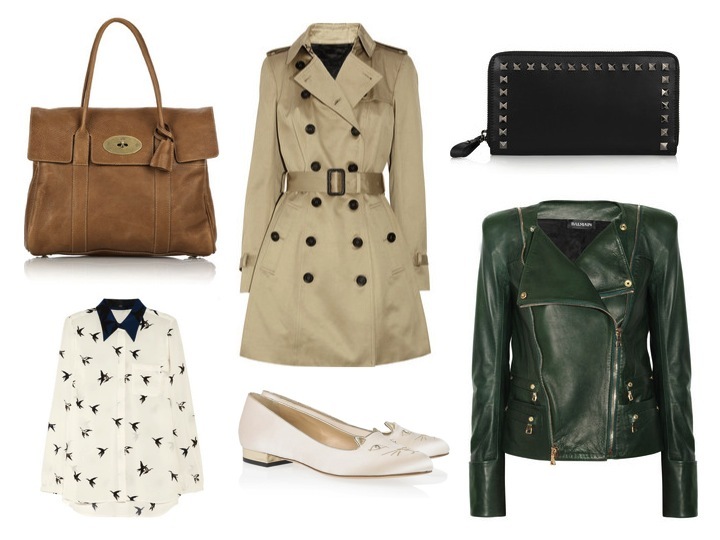 Mulberry Baywater Bag, Burberry Trench, Valentino Wallet, Tibi Shirt, Charlotte Olympia Kitty Flats and Balmain Leather Jacket. It's that time of year again when all the fashion minds congregate in New York, London, Millan and Paris for a little thing called fashion week. Like every other fashion obsessed girl I have been glued to my laptop and iphone trying to feel like I am experiencing everything firsthand. Instead of showing you my favorite collections or street style snaps like every other blogger in the universe I thought I would show my wish list. You may have already noticed that none of these items have graced the catwalk over the last few weeks. Even though I am awed by the new collections and shows when it comes to splurging on designer items I am more drawn towards classic pieces. So if I had endless amounts of money to splurge these are the items I would rush out to get my hands on. I think the most outrageously priced item here, and the one I am pining for most is the beautiful Balmain Jacket. Maybe one day I will be lucky enough to call one of these babys mine. Have you been keeping up with the fashion week action?